We are super excited to announce immediate availability of the FreePBX v3 Developers Preview and invite you to get involved to help make this the best PBX application ever! We’ve taken FreePBX’s 5 years of experience plus tons of user feedback, and merged this with the TCAPI project (announced last year at ClueCon) and drawn on some great contributions from the Bandwidth.com Phonebooth Project to create a great foundation for the next generation of FreePBX! FreePBX made its debut in October, 2004 as the AMP project (Asterisk Management Portal) but quickly changed its name to FreePBX in anticipation of new telephony engines coming down the pipe. At that time we adopted a new modular design which resulted in its proliferation and wide community contributions that continue to be strong today. 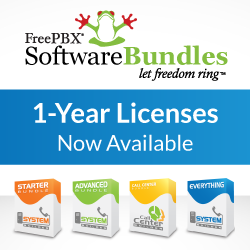 FreePBX has a lot to be proud of as it has become the defacto PBX interface in this space with millions of downloads and an installed base counted in the hundreds of thousands! After months of heavy evaluations, we are making available a developer platform to encourage wide participation to build this into the best platform ever! The initial release includes a FreeSWITCH dialplan generator with FreePBX thanks to the great expertise brought on with the TCAPI project! We are super excited to see the development of other dialplan generators soon and with such a great development community available, Asterisk work is already under way and we hope others will be on board quickly! You can find LOTS of great documentation and examples on the project wiki as well as a fully functioning ISO for download coming soon to get you started evaluating and contributing to this great project! We are super optimistic that our efforts to make this project easily accessible to developers will assure its rapid evolution and we look forward to meeting you on the IRC (#freepbx-dev) and Forums. In the meantime, FreePBX 2.x has a 5 year head start so it’s still going to take some time for this new version to catch up with comparable features and stability. Therefore, we are simultaneously announcing the formal beta of FreePBX 2.6 to be released by the end of this week (and has been available from SVN for quite some time). This will assure the current FreePBX v2 installed base is strongly supported while v3 quickly evolves. We are super excited to be bringing so much great stuff to this fantastic world of Open Source Telecommunications which continues to disrupt the whole industry; we are looking forward that these new developments will further intensify that! For questions about v3, see the FAQ.